One-arm dumbbell preacher curl, also known as one arm preacher curl and single arm preacher curl, is an effective movement for not only gaining mass but also strength in bicep muscles. This is a good exercise to isolate biceps and build well-developed bicep muscles. The reason why it’s effective in building well-developed bicep muscles is that it isolates your upper arm through stabilization when it is positioned on top of the preacher curl or an inclined bench. It works same as barbell preacher curl except that you use one arm holding a dumbbell. You alternate your two arms so as to allow them work independently. The best part of this exercise is that your shoulder joint & front deltoids remain stabilized, enabling an exceptionally high concentration to target and build upper arm muscles. Fix the preacher curl bench at an appropriate height, so that neither you have to lean onto the preacher pad, nor you need to raise shoulder because of the excess height of the pad. Grab a dumbbell in one hand with a secure underhand grip (palms facing upwards) and place the back of your upper arm flush against the preacher-bench pad or the incline bench. You can use the opposite arm for stability. (i) Using a slow and controlled tempo, lift the weight toward you until your bicep is fully contracted & the dumbbell is at shoulder height. Your elbow should remain in contact with the pad all through the movement. Do it slowly, so that you feel tension building in your biceps. If you don’t feel tension that means you’re swinging the dumbbell, and not using the muscle to do the work. Also to achieve full contraction you have to bring your small finger higher than the thumb at the contracted position and squeeze the bicep hard for a second. (ii) After you reach the top, slowly lower the weight until your elbow is just short of full extension and the bicep is fully stretched. Repeat for the recommended number of repetitions and then switch arms and repeat the movement. 12 to 15 repetitions of 3-4 sets. Try to increase the resistance after each set. (a) Your elbow should remain firmly in a fixed position and in contact with the pad all through the movement. (b) Work on your biceps only once in a week for the optimum results. Since, it’s a smaller muscle group, you don’t need to target them with lots of sets and large number of exercises many times during the week. Train your biceps hard once per week and then let them rest and recover so they get proper time grow. I recommend this exercise because your upper arms rest on the pad, so shoulder flexion is eliminated from the lift. 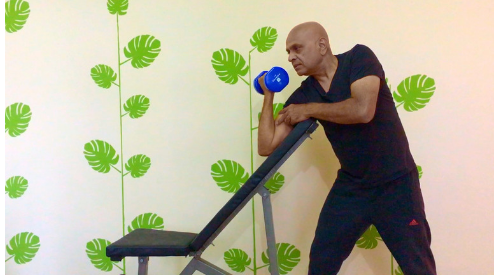 That’s exactly the reason this biceps workout is an ideal method to avert cheating and achieving optimum biceps contraction by separating elbow movement from rest of your body. Moreover, as this exercise can also be done in a seated position, it is easier on your back as compared to standing curls. Previous articleHow To Get Rid Of Belly Fat After 60? Next articleHow To Lose Belly Fat After 65?